With only 4 section numbers to remember, this seemed to be the cleanest approach. 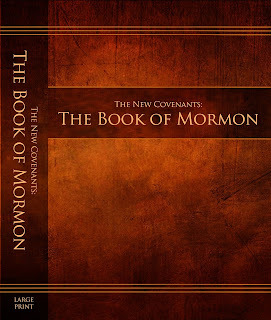 Some have requested a stand-alone Book of Mormon to share with others, or simply to be less obvious. We have formatted one like we did with the Large Print version. This new compact version measures 5.25" x 8" and has 550 pages - that's the best we could do. It will be available on Amazon, we hope, as of Monday the 8th... It's now live. NOTE: If Amazon shows that one of the books is OUT OF STOCK or does not give a price for a NEW copy, that simply means we are in the process of uploading and approving an update that is adding to or fixing the current version. It will be available again within 24 hours. Several have asked about the wording of the vote in Layton. Lots of people have made wording suggestions. We have carefully considered every one. Here is the online wording we have chosen. The wording at the conference will differ only in that the conference will be asked to stand before voting as a visual cue to the witnesses. Feel free to pass this along. Several online comments suggest this vote in Layton is from the scriptures committee. That committee has been disbanded and this effort is being brought forward by myself and Gordon Platt and others not from the scriptures committee. The Book of Mormon text has been finalized! In part two of the voting process in Phoenix, many of those who preferred another Statement of Principles set aside their preference and agreed to accept the majority’s choice. 90-95% of the conference agreed to accept the Lots document. The third and last part of the vote was cancelled in Phoenix, out of a desire to avoid contention and we respect the right of those that made that decision. The purpose of the vote in Layton is to determine whether covenant holders are willing to adopt the Lots Statement of Principles as a guide and standard to be printed in our scriptures. This is not an attempt to determine WHICH document to adopt; that voting was done in Phoenix, and the Lots document received 90-95% acceptance. A vote to adopt would include those who favor the Lots Statement of Principles AND those who have another preference but are willing to join with the majority’s choice in order to complete the Lord’s assignment. Voting to adopt does not mean you agree with the Statement of Principles in every particular or feel that the document or process is without flaw. A vote against adoption is appropriate for those who cannot accept the Lots Statement of Principles or the vote by which it was chosen and do not wish to see it added to our scriptures. Because work on the Book of Mormon has now been completed, we have been able to format a large print version. It is now available on Amazon here. It is the same page size as the other scriptures on Amazon (7" x 10"), but the font is now 13 pt. with generous spacing. It is very pleasing to the eye of any who have sampled it. The book is 664 pages. We hope to provide other works in large print format as soon as they are completed. The process begun in Arizona involved an initial vote to choose a document. There was a second vote planned, but the process was called off before it took place. That second vote was intended to be a sustaining vote to adopt the chosen document as our guide and standard. Numerous people have argued that the majority vote in favor of the Lots' statement indicates we sustained it. That is incorrect. The first voting - what took place on Saturday - was described in advance as a vote to choose a document from the many presented and any not presented. At no time was it stated or implied that it was a sustaining/adopting vote. It was explained that a vote to adopt the chosen document would take place on Sunday. There was also a period of discussion, persuasion, reasoning, etc., required to take place after the first vote, both to make sure there was no Achilles heel to the document that might only be known among the opposing minority, and to allow persuasion to inform and change minds before our voting to adopt any statement as binding. Only then, after that work took place, could a sustaining vote be reasonably taken to adopt and canonize the chosen document. It makes a difference. The attempted steps were not completed. It's like claiming you own a car in the dealership's lot because everyone at the dealership agrees it's yours. But until you sign the papers, you have no legal right to or responsibility for that car. And until we legally bind ourselves to a statement of principles by a sustaining vote, we cannot be held accountable, nor can we claim any rights or blessings resulting from obeying the Lord's command to produce such a statement and then add it with our scriptures. We have yet to sign on the dotted line. There may be more to clarify, but I hope others can do that and I can be done. If I have to say more, it'll be soon. I don't want to drag things out. I have a few clarifications to make, but only time to make one on this post - I will do another post by tomorrow. I received an email from someone who was present when the Dancing with Wolves podcast was recorded and they asked for clarification from Denver on how the decision-making example applied. They said this was Denver's response, "The answer about problem solving was independently asked and answered and involved how a group of people, like a fellowship, could avoid conflict while attempting to reach a decision. It was in that context that the question was asked and answered. I'm not sure it could be possible to have a group of hundreds, or over a thousand, have any meaningful use of that method. Too many voices would be involved." Having made that progress report on behalf of those still involved in completing the scriptures project, I’m now going to address another issue regarding the scriptures. And this is coming from Chris Hamill, no one else. The rest of this post is my own opinion and perspective. I am not speaking on behalf of the former scriptures committee, or any group or individual other than myself. Also, what I’m about to say comes after many, many emails, conversations, texts, etc. with individuals, groups, and factions that all promote different agendas, but that often do not interact with each other. I am making my own observations and not giving directions or decisions. NOTE: I need to apologize in advance – this is a helluva long post. But if we’re going to deal with something difficult or unpleasant to some of us, let’s get it all out at once and not drag out the discomfort. One piece is still missing from the scriptures. We do not have an agreed statement of principles. There has been a long silence on the issue of a guide and standard, but recently some have started to bring up the topic again. From some of the things that are being blogged and emailed, it appears I owe everyone an apology. I’ve obviously not been clear about my involvement in the process. To be clear: I’M NOT IN CHARGE OF THE GUIDE AND STANDARD EFFORT; I’M NO AUTHORITY THAT MUST APPROVE SOMETHING; I’M NOT A REFEREE. I AM A SERVANT AND WILL ACT ON WHAT THE COVENANT PEOPLE (NOT ONE GROUP OR FACTION WITHIN THE LARGER BODY) DIRECTS ME TO DO. I DO NOT MAKE THE FINAL DECISION. In other words, I do not control what gets added to the scriptures, nor how it will be added. That is the responsibility of the covenant people to decide. The (disbanded) scripture committee is of the same mind, both in regards to my role and to their role. Again -- once a statement of principles is sustained by the people in a general conference, it will also be added with the scriptures. Ever since the March conference in AZ ended, there has been mainly silence on the G&S matter. Everyone has been waiting for someone else to do or say something. And many have been pointing to the scriptures committee to be that party. The disbanding of the committee should have made it clear that the committee was never responsible for the G&S, only for seeing that it gets added according to the will of the people (more on that in a minute). Within the past few weeks the matter of the G&S has reawakened. I’ve heard that some have no stomach to even deal with it. Others are leaving the movement because nothing has been accomplished. Some still believe that there is a secret hierarchy or strongmen in control. My explanation above ought to make it clear that the responsibility has always rested with this people as a whole. We’re too conditioned to want to place blame or responsibility on others. We need to look at ourselves. The scriptures committee never had any direction or permission from the people to act. Some of us get a sick feeling in our stomachs just thinking about all the guide and standard mess. We don’t want more of it. But it’s like a bad tooth. We can’t ignore it because it will just get worse. The longer we put it off, the worse it will get and the harder it will be to remedy. When I was ready to come home off a mission, my mission president shared something with the departing group that I’ve never forgotten. He explained that there are 3 kinds of problems: direct control, indirect control, and no control problems. But there really is only one answer to all 3 problems – I have to change. Regardless of how you view the guide and standard assignment, the answer is the same – “I” have to change. So, what are the conditions the scripture committee is waiting on in order to ‘add them’ as we’ve been commanded? The answer is, “You.” The scriptures committee has said it many times in posts and I stated it earlier – we are not in charge, and have no control or authority, etc. With no standing committee, and with attention pointed to me, I’ll state it from my stand-alone perspective: I have no right to choose a document and add it. I’m waiting for the people to agree on a statement (arguably this may have already happened), to accept it in a conference as a guide and standard (has yet to happen), and to then let me know their final decision (please help that happen). My ONLY possible reply to the people, once that happens, is, “As you wish.” In the meantime, “I” (check your mirror) have things to accomplish. Don’t look to Chris Hamill or to Denver or to Rob or to Log or to any individual or small group to solve the problem. It rests on each of us individually. The Covenant asks us 4 questions. They begin: Do you believe ... Do you have faith ... Do you accept ... and only once, Do you covenant ...? That question asks: And do you covenant to seek to become of one heart with those who seek the Lord to establish His righteousness? This is the core issue. But notice that the bar is not set too high. There is no expectation that we be of one heart, only that we will seek to become so. The Lord expects us to have failures, to make mistakes, to get things wrong. Consider how often children have to be corrected. We should expect the same. And in the Covenant the Lord has promised to work with us, which gives me hope. Further, that expectation can be found in Denver’s explanation of how Zion will unfold: a small number will come together and will have to work out how they will be of one heart. Once that is worked out, another family joins and the process happens all over again. This continues over and over until all of Zion is filled. Is it even necessary that we carry out the assignment of writing a Guide and Standard? “You are not excused from writing a statement of principles…” This seems pretty clear. Has the assignment already been completed? Have the people (not a group or faction within the larger body) agreed on a particular statement and formally adopted it? Has that statement been added with the scriptures? There is only one document in heaven and someone needs to receive it by revelation in order for us to have it…Again, “You are not excused from writing a statement of principles…” indicates where the document originates. Is a single G&S required movement-wide or would several G&Ss meet the requirement? “You are not excused from writing a statement of principles…” Singular. Does the G&S need to be printed as part of the scriptures or does “also add it” mean something as simple as inserting it in our copies of the scriptures, as many have already done. The original assignment given by the Lord to the scriptures committee at our first meeting was that the committee was to write a replacement for D&C Section 20 (see T&C 156:20). That assignment hasn’t been changed, other than the voice of the people requiring they approve it first, and then the Lord shifting the responsibility to the people as a whole in the Answer. It appears it belongs as a section in the T&C. I acknowledge the scriptures committee held this view at one point, but have since realized this was not sufficient to satisfy the Lord's requirements. Has sufficient time passed to allow another go at completing the assignment? Were earlier attempts foolish attempts to rush too fast or “rush the pass”? Like a bad tooth, it will only get worse and harder to deal with the longer it gets put off. “Rushing the pass” from Denver’s vision refers to acting without the Lord’s direction. We have direction from the Lord on what to do. Is an online effort acceptable or does this assignment require being physically together to accomplish it? Does the statement have to be adopted in a conference or will a simple vote suffice? All 3 steps proposed for the conference in Gilbert, AZ (choose a document, respectfully address dissent, adopt the document) are required by the Lord for the matter to be settled. Should we refrain from telling others “the Lord told me...” or is God was giving individuals assignments on the G&S which the greater body should get behind? “You are not excused from writing a statement of principles…” is a collective requirement. Why would He then start piecing out parts of what He already has assigned to all of us? Should we start over and see just how many points we could agree on to produce a guide and standard and abandon for now the points we can’t agree on? This might be as basic as “love God, love your neighbor, and get baptized” if we can only agree on 3 points. How does that address the needs of “others who know nothing, as yet, of my work now underway, and therefore…bless, benefit and inform them”? Do we have to be of one heart for any document to be acceptable to the Lord. See the discussion above about the 4 questions in the Covenant. I’m not the one to tell anyone what should be done to complete this assignment. So instead, let’s consider where we are as of the last conference. By March of this year, many proposed statements had been advanced by individuals and groups. An online vote, available to anyone in the world for many days, had been held, and the outcome of the approximately 500 participants was a 93% approval for what was called the “Lots’ document.” The pushback from the scriptures committee - at the time - was that 500 people out of 1500+ recorded baptisms indicated that the outcome only represented a majority of a minority and that it couldn’t reflect the voice of the people. Hindsight, however, has opened at least my own eyes to other factors that should have been considered: Many simply don’t want to participate (based on the availability of the vote); some may never know of our efforts; some who have been baptized won’t participate because they haven’t received the Covenant. These factors, and maybe others as well, make it more likely that the initial vote WAS fairly representative of the voice of the people. If so, I apologize for our shortsightedness. After that initial vote, an attempt was made to address those opposed to the Lots’ document or who didn’t vote. Those involved with the Lots’ document effort talked with any not supporting the document for several months afterwards. They were very well received by most, but when conversations began to become a bit contentious, they determined that continued outreach would do more harm than good. Yet they spent hundreds of hours listening to and discussing the opposing views. The conference in AZ included another vote for a document, looking for one to rise to the top. It was open to ALL potential documents. Again, the Lots’ document gained a significant majority of the votes. It was only when those who disagreed began to voice their opposition that things fell apart and the process was subsequently halted by the conference organizers (not the Lots group). Things then went silent until recently. Do we trust the Lord, that He can, as a loving parent, see that things turn out as He desires, despite our own limitations and brokenness? Does everyone have a voice/vote that wants a voice/vote? What can be done to provide for that? Are factions competing or cooperating? If competing, what needs to happen for that to change? Do we need to start the process over or can we bring competing ideas together? If more than one group has received approval from the Lord for their document, what is the bigger picture that allows this to happen? If someone disputes the outcome and remains unpersuadable, what step(s) need to be taken to resolve the impasse? Will we assume that we have become of one heart if we agree on a document, or will we realize we must continue to seek to become of one heart, as we covenanted? Will we continue to study to learn how to respect our brothers and sisters and to come together? Is there a way to take that on? Will many meek people remain silent and allow a process to complete, even if they object to the process as well as a document, and then resent those who may have pushed it on them or who did not listen? Or will we do all we can to create a safe environment for discussion and respectful disagreement? Are the failures and flaws experienced during this exercise part of the learning process? If so, what will make our shortcomings become acceptable/tolerable to the Lord? Because the Lord requires us to choose a document, persuade opposition and formally adopt the document as a people – all 3 steps attempted in the conference in Gilbert, AZ – what remains to be done? Are ~3 weeks (from now until the conference in Layton) sufficient time to alert people that a decision will be attempted? And if no decision is reached, what then? If the Lord could accept the scriptures project in an incomplete state - enough to extend the Covenant - can a document be adopted with the understanding that some MINOR adjustments may still need to be made prior to publishing? Is it possible to adopt one document in the scriptures and, if another one is also deemed important or useful, add that one to the Appendix (which is not considered scripture), perhaps as a tool? How will we know we’ve completed the assignment? Who can determine that a decision has been made for the people? Perhaps a metaphor might shed some light: Imagine we’re at a train station to catch the train to Zion. Most of us have decided that train #7 is the right one. A few argue that it can’t be because they are convinced that the train has to be blue and #7 isn’t blue. No matter the discussion, some of them insist we all have to get on a blue train and no one can get on a train if we dispute. #7 powers up; the conductor yells, “All aboard!” If I’m convinced that a blue one is the train for me, I need to find that train, but I have not right to hold anyone hostage by my decision -- they should be free to choose what they want. If I’m convinced #7 is for me, I can’t leave the decision in the hands of someone else. It’s up to me to decide what I will do. If it so happens that the majority of the group thinks the same way and gets aboard #7, their individual decisions collectively demonstrate the group’s decision. No one has made a decision for anyone else, but the group has made a common decision to take #7, with a few freely choosing an alternative. The remaining few will have to decide whether they will wait for a blue train or want to join with those who are convinced #7 is the right choice. And perhaps the larger body could offer to paint #7 blue? I can only hope that at the next conference, or one very soon, we can offer a prayer such as: Father, despite all of our offensive behavior, we have come together and adopted a statement of principles for a guide and standard for this people, as you have commanded. Please forgive us of our failures and shortcomings. We recognize that we are still not of one heart, but we remain committed to that objective. Please tell us if you accept our decisions and our statement, or correct us so that we can make them acceptable to you. We hope that what we present to you demonstrates our acceptance of the covenant you have offered us. At the Gilbert, AZ conference in March, the scriptures committee stated that we thought the work on the scriptures was completed and that the next 6+ months would be used by everyone to read the scriptures with the intent of finding any typos or issues that needed to be addressed before preparing them for printing in a leather-bound, onionskin version. Many have emailed us issues that they’ve found and we thank everyone for the help. Several on the now disbanded committee have also proofed the Book of Mormon meticulously. We discovered a number of issues that we either had missed or hadn’t identified before. We also realized that by using many volunteers for the work, we created the problem of many styles and perspectives on grammar and punctuation. However, every issue has been addressed to the best of our ability. 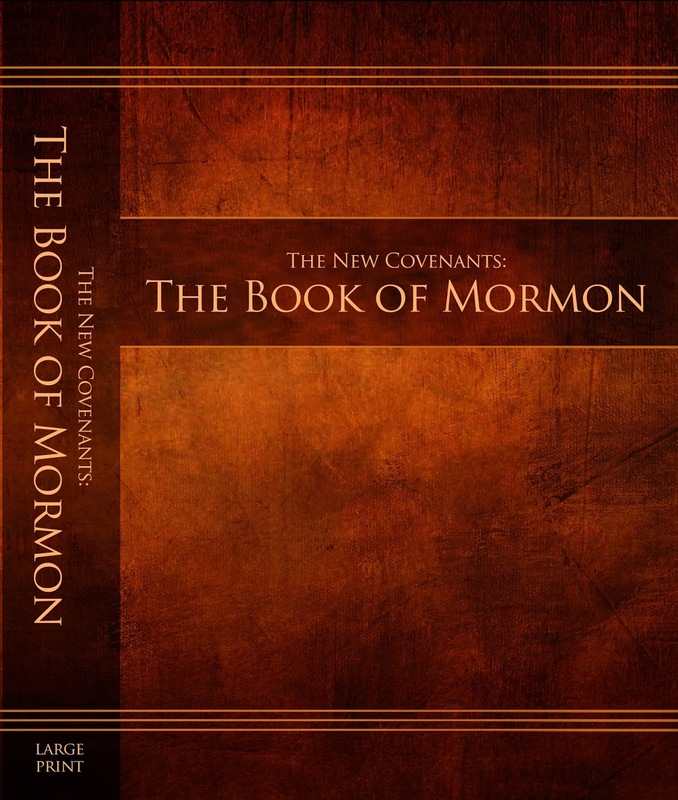 The finalized version of the Book of Mormon will shortly be uploaded to Amazon and will hopefully be included in Volume 2 by the end of the week. It is likewise being sent to www.scriptures.info and will be updated on that site prior to the conference in Layton at the end of September. A similar review of the T&C and New Testament is underway. There is less involved with those works, so we hope those efforts will move more quickly. This will be followed by a review of the Old Covenants. Many people have asked how soon we will be printing the leather-bound, onionskin scriptures. As soon as the New Testament is completed and Volume 2 is formatted for that set of scriptures, publishers who have been identified will be sent a proof of Volume 2 for bids to print sets of all 3 volumes. Because volumes 1 & 3 are larger/smaller than volume 2, a bid for 3 pieces that are the size of Volume 2 will get us a good ballpark cost. As soon as we have a couple of competitive bids we will announce it. That will also likely give us a timeframe for availability. Once the leather-bound scriptures are well underway, we will make sure that all electronic versions are made available/u[dated, and that a very large print set is considered through Amazon.